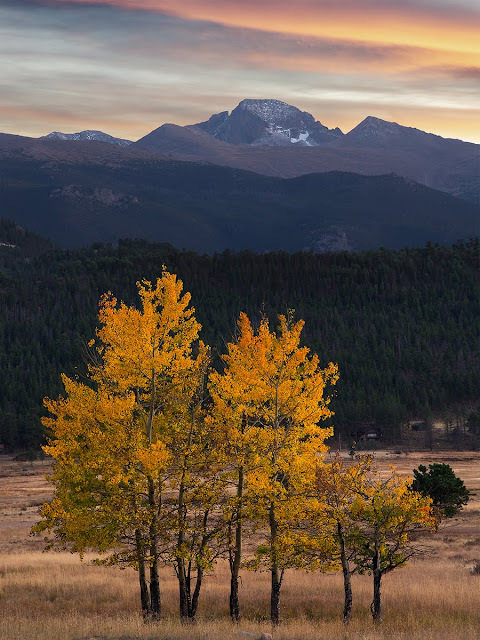 Just finished my second four seasons project featuring Longs Peak, the king of Rocky Mountain National Park. 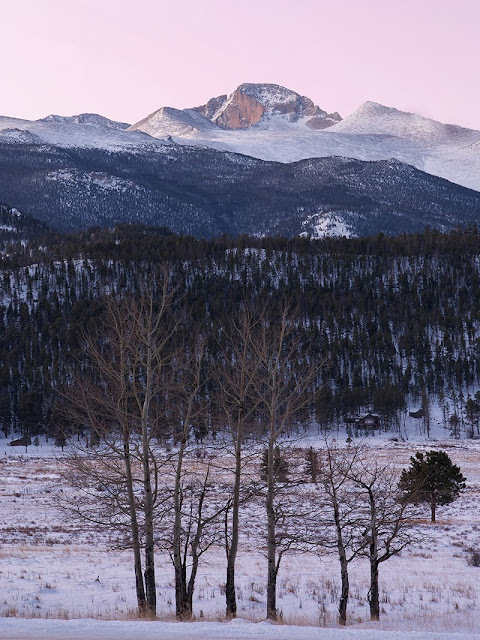 This series of images was taken in the Moraine Park area with a view of the eastern face of the peak known as the "diamond". There was a group of aspens standing alone right in front of the peak in an easily accessible area. From left to right, the seasons represented are: Spring, Summer, Fall, Winter. Each was taken at the exact same location at different times of day and different times of year capturing a lapse in time. This image was taken after one of the wettest seasons of the decade. Snow lingered on the mountain well into the month of July. 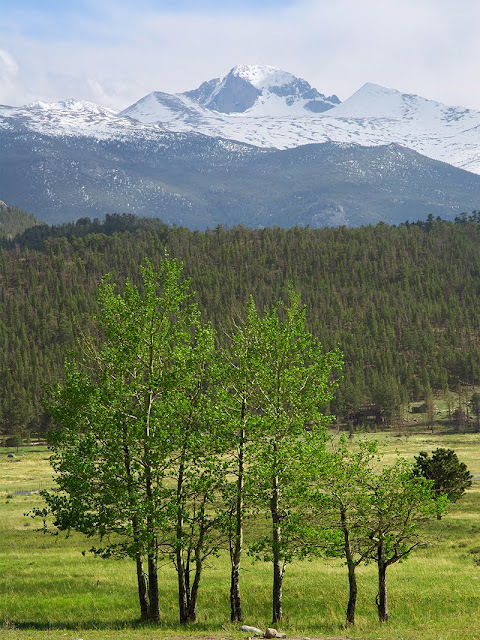 The fresh bright green growth of the trees and grass contrast with the white blanketed peak. This photograph was captured mid afternoon. The summer image looks a little hazy in the distance because of the smoke from the huge wildfires on the west coast caused by a severe drought. 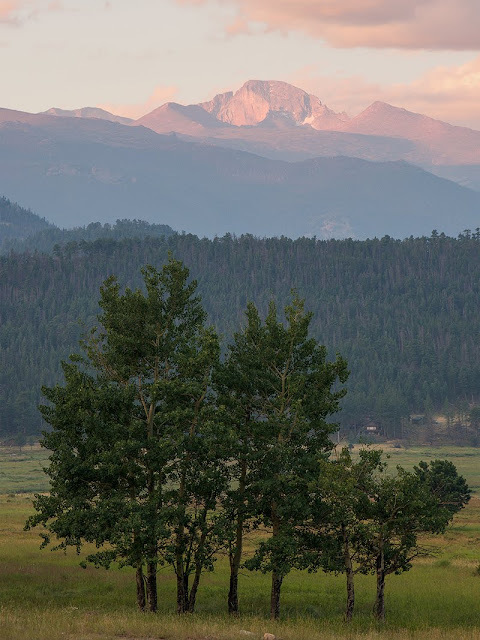 The smoke and haze from these fires traveled all the way out to Colorado and created a soft pink glow on the peak this morning at sunrise. The Autumn sunset image took the most work to capture. I visited this same location more than 10 times during the fall color season waiting for this small group of aspen trees to turn to gold. This specific little aspen stand must have been the last group in the whole park to change their colors! It wasn't until the end of October that they began to show off their fiery colors. After the sun went behind the peak on this evening, it lit up the sky in warm hues that complimented the color in the trees. This one was taken right after Christmas day on a frozen December morning before dawn. Just as the sun rose, it turned the sky a bright purple above the peak and bare trees. The winds were strong and I stood outside dancing around trying to stay warm next to my tripod. Note to self, bring gloves next time.